On Saturday 12 June 2004 at 8:00pm The Gatherings Concert Series will present a Synthesizer Workshop at St. Mary's Hamilton Village. This workshop is open to anyone interested in learning more about the concepts upon which Electronic Music is based. If you have ever been to a concert at The Gatherings series and wondered about how the synthesizer functions and how individuals use this instrument to create music, this workshop is for you! The workshop at The Gatherings will be headed by veteran synthesist Terry Furber, a leading talent in the field of home synthesizer design as well as in music performance with his Spacemusic duo Orbital Decay (who have performed live on STAR'S END, EMUSIC, Soundscapes, The Gatherings Concert Series and most recently at Gate to Moonbase Alpha on 16 April 2004). Demonstrating on his hand-built MOTM modular synthesizer, Furber will discuss the history, technology, equipment and basic concepts involved in making sounds and producing music. Attendees will have an opportunity to observe close-up the workings of a synthesizer, hear how tones are created, modified and turned into music and learn how these means might be used in their own creative endeavors. Whether you are a beginner, a music fan or have advanced knowledge, you will come away from this workshop with a better understanding of the synthesizer, the people who use them and deeper insight into and better appreciation of the many genres of music inspired by the synthesizer. "The inspiration for modular synths date from the era around the 1970's, when engineers were trying to incorporate the discoveries of the electronic semiconductor revolution into the music field. In order to explore the physics of music, they designed modules that attempted to electronically reproduce the functions of non electronic instruments (acoustic). The original modulars were handmade in very limited numbers and were very expensive. They inspired the creation of best selling keyboard instruments such as the MiniMoog and Sequential Circuits Prophet. Although briefly popular, they faded before the onslaught of cheap off shore digital keyboards. 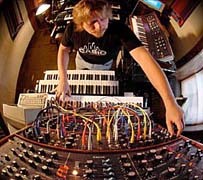 Modulars were rediscovered in the mid 1990s and became prized for their analog sound and radical appearance. The early units soon started to be discovered in garages and university storerooms and began to fetch astounding prices. A few dedicated designers started building modulars again, using modern components and up to date quality standards. Today there is a myriad of available modules..."
Although workshop attendees may arrive without any significant knowledge of synthesizers, it is strongly recommended that this comprehensive article be read prior to our session. Here H. M. Sowards provides an excellent introduction to the basics of synthesizer technology. Although workshop attendees may arrive without any significant knowledge of synthesizers, it is strongly recommended that this comprehensive article be read prior to our session. Here T. Yala Abdullah provides an excellent introduction to the basics of subtractive synthesis (also known as anaolgue synthesis). While the author of this article for COMPUTER MUSIC approaches analogue synthesis from the standpoint of someone using modeling software and a computer to create Electronic Music, the principles upon which this type of synthesis is based is derived directly from hardware synthesizers (such as the kind to be used at our workshop). It is strongly recommended that this four page article be read prior to our session. 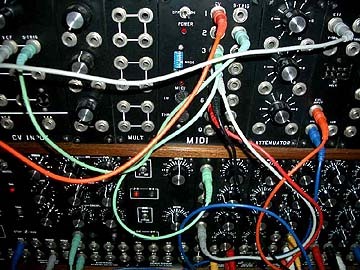 Gino Robair's article for ELECTRONIC MUSICIAN Magazine is a comprehensive guide to getting started in modular synthesis. Included are sections on creating your own system and choosing the right synth as well as an overview of several popular companies currently producing modules and systems. What actually are harmonics? What are waveforms? Where do they come from? In Part 1 of his 29 part series for SOUND ON SOUND Magazine, Gordon Reid goes back to basics to answer these three questions and applies these basic principles of the most common form of sound synthesis, subtractive synthesis. Part 3 explains how synthesized sound changes over time through the use of modifiers. In this series for SOUND ON SOUND Magazine, Steve Howell briefly covers in Part 1 the history of modular synthesizers followed by information on filters and ring modulation, Part 2 covers controllers, low frequency oscillators and modulation possibilities and Part 3 deals with how the analogue sequencer works as well as arpeggiators and other controllers. Demonstrations at the 12 June Synth Workshop will be based around Terry Furber's MOTM Modular Synthesizer. The Synthesis Technology website offers details on the nature of this instrument and the "no compromises" attitude adopted by this company. Included are listings of all available modules both in kit form or pre-assembled, hardware, demo audio clips, artist profiles and system photos, etc. 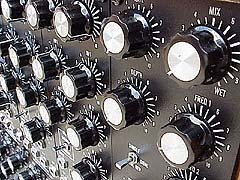 The UCSC Electronic Music Studios website maintains a vast archive of synthesizer related material. The link below leads to a webpage which covers the basic concepts and functions of the essential modules and the interconnections needed to realize electronic music. Studying this material is one way for beginners to grasp the fundamentals of analogue synthesis. While the conventional 12 tone piano keyboard has become the standard method of playing sounds created on the synthesizer, it is by no means the only method available to interact with this intsrument. Joe Paradiso's article for the MIT Media Laboratory enlightens readers to the many alternative and imaginative tools available to those seeking expression beyond what is commonly available. To an extent, Paradiso also chronicles early synthesizer technology. "Trevor Pinch and Frank Trocco tell the story of the invention of the Moog electronic synthesizer, the people who created it, and its impact upon music and popular culture. The book focuses on what Pinch and Trocco call the "analog days"--the early years of the synthesizer, between 1964 and the mid-1970s, before the technology went digital. The authors trace the development of the Moog synthesizer from its first conception as a huge modular instrument for studio use though to the Minimoog--the first portable keyboard instrument typical of today's synthesizers. As they relate the history, Pinch and Trocco show how electronic sounds, once considered marginal or weird, entered our mainstream culture, producing a revolution in the way that music is produced and consumed." The Gatherings Concert Series hosts the Synthesizer Workshop with Terry Furber on Saturday 12 June 2004 at 8:00pm (doors open at 7:30pm) in the parish hall of St. Mary's Hamilton Village 3916 Locust Walk (just east of 40th & Locust) on the Penn campus in West Philadelphia. Requested Donation: $5 - $10 at the door. All ages welcome. No previous knowledge of music or technology needed.